beautiful and fresh when they are delivered to your door, but they also are easy to maintain and can last many years if taken care of properly. Read on in our topiary how to to discover why purchasing a live ivy topiary is one of the best decisions you can make. Stop throwing away your money on fresh-cut flowers that wither and die in a few days. Enjoy the beauty of a live ivy topiary for years to come! 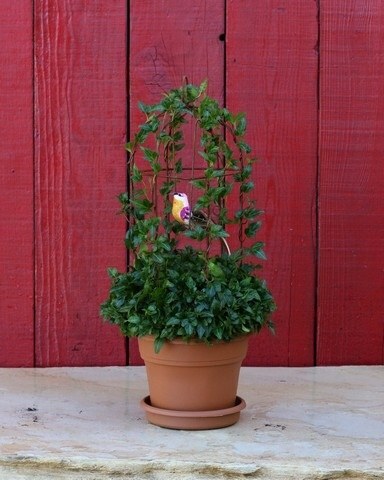 Our topiaries are shaped into birdcages using the sturdy vines of the plant. A small faux bird perches inside the cage. Within weeks of receiving your gorgeous topiary, you will begin to see it bloom. The topiary does not have flowers, but it has lush, tiny green ivy leaves that will explode from the branches, filling out the birdcage and producing a full, green plant. The base of the birdcage topiary is filled with more blooming ivy that completes the full look of the plant. Add this topiary to any home or office design to bring in fun and whimsy. The topiary also makes a gorgeous addition to a bedroom – especially when you purchase two. Place a topiary on bedside tables, as pairs on a mantle, as guards of the door and as guests on your hearth. As long as your live ivy topiary is not placed in direct sunlight—but still has access to indirect sunlight—it will thrive. You don’t need to worry too much about temperature and keeping this plant alive. It can survive in temps as low as 40 degrees and as high as 80. What you will need to maintain is the live ivy plant’s water intake. Just check the soil every day to make sure it is moist. Add a little water every day to keep the soil as evenly damp as possible, but never wet. The worst thing you can do to your live ivy is over-water it. That’s all you have to do to keep your ivy topiary happy and to enjoy it for many years to come! BIRDCAGE Ivy Topiary. Let soil approach dryness between watering. Do not let roots sit in water. Exposure: Bright, indirect light. Indoor Temp: 40 - 80 degrees F, Weight: 4 lb, Pot Size: 6.5 inches, Height: 19.5 inches.